Live dates - grahambellinger's JimdoPage! 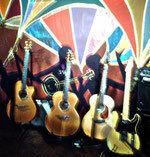 Graham plays every Tuesday evening at Alexanders in Chester where he hosts the open mic with The Deportees. Listed are Deportees, Deacons and solo gigs and the gigs I sometimes do in other line ups.